Kent Merryfield, left, and students from the American Regions Mathematics League in a photo display in the hallway of the faculty office buildings. Photo by Valerie Osier. 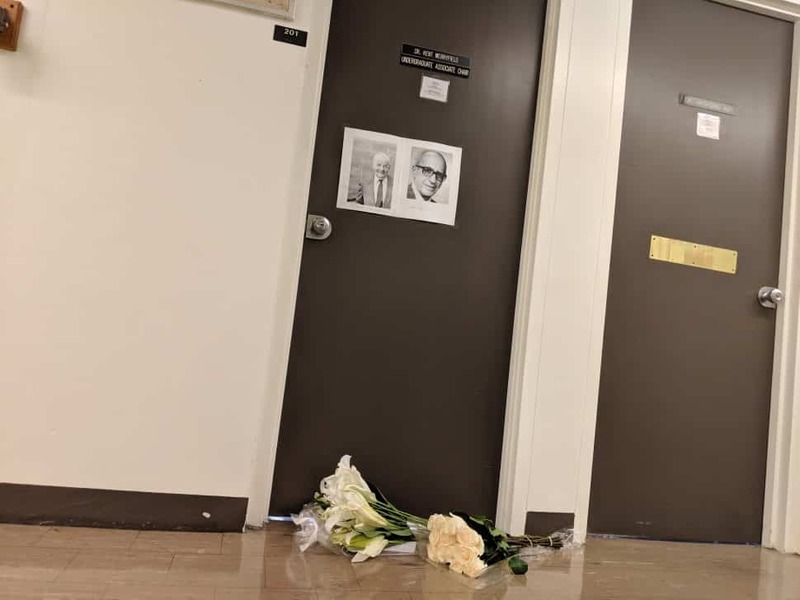 Bouquets of white flowers laid at the office doorway of Cal State Long Beach math professor Kent Merryfield Wednesday afternoon. The hallway was quiet without the classical music that would often drift through his door. CSULB professors and students in the math department were mourning the beloved professor who died Tuesday after sudden cardiac arrest at a restaurant on campus. He was 65 years old. Kent Merryfield at a Cal State Long Beach graduation. Photo courtesy of CSULB. Merryfield was more than a professor—he was an advisor, a coach to young students and a leader in his department, according to those close to him. “This is a tremendous loss to the department and this loss will be felt at every corner of the campus, and in many high schools in Southern California,” said Tangan Gao, chair of the department. “I say they could replace me immediately if I died, but I can’t replace Kent,” Gao said. Merryfield was the associate chair of the department for 13 years. His colleagues called Merryfield a “human database” in reference for his encyclopedic knowledge about students and their academic records. He knew kids from all over the Southern California math crowd from his involvement in the American Regions Mathematics League. He established the Southern California chapter of ARML and coached the monthly meetings at CSULB. Many of his students from there and CSULB went on to prestigious programs at such universities as Stanford, Harvard, Oxford and MIT. Merryfield ran the “Math Day at the Beach,” where more than 300 high school students from all over Southern California compete and solve math problems. It was like all the holidays, plus the NCAA tournament rolled into one for him, according to Angelo Sagalla, another math professor. He was formerly an undergraduate advisor for the program before he trained Murray to take over that job 11 years ago. 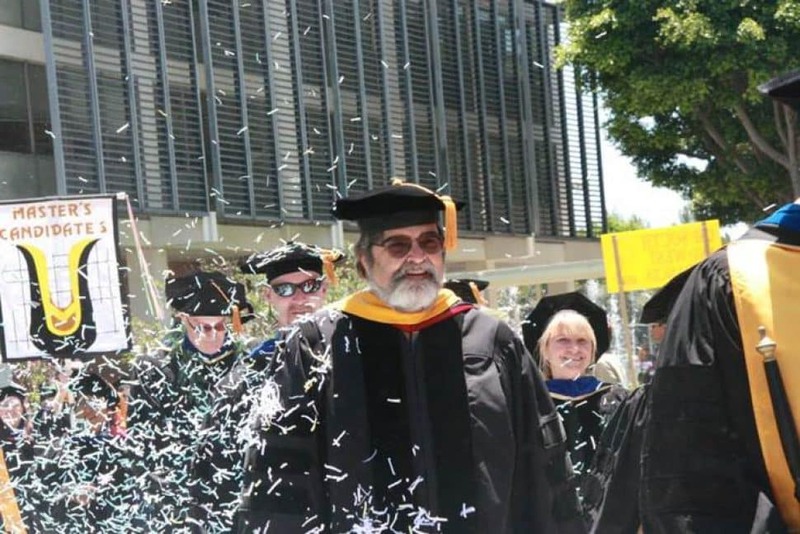 He went on to be the associate chair of the Department of Mathematics and Statistics and has been a professor at CSULB for more than 30 years. Merryfield was well known in the department for not “doing small talk,” but not because he was being rude, Murray said. It was because he always wanted to make his words count. It was widely known among the department that he never said “Hi” in the hallways, he would merely nod when people greeted him. “Everything he said had content, meaning and substance,” Murray said. His chuckle at the end of quick discussions was his signature. Staff and students left flowers at the office door of Kent Merryfield, who died Tuesday on campus after sudden cardiac arrest. Photo by Valerie Osier. Classical music could often be heard coming from his office. He loved the genre and would give talks on the math involved in the vibration of strings in music. He picked up the viola when his son started to learn the violin years ago, Sagalla said. Merryfield eventually became skilled enough to play in the Long Beach City College orchestra. 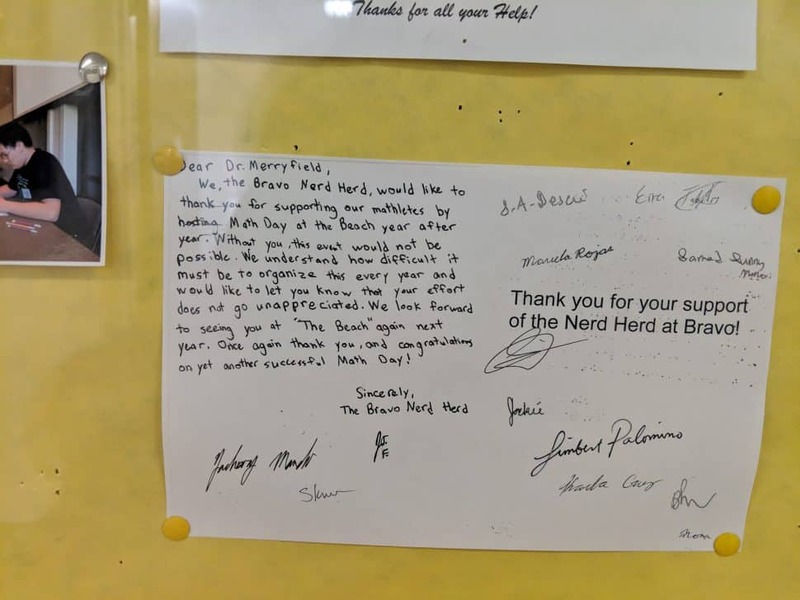 Merryfield was an “absolute guru” in his field, with other professors citing him in their lecture notes and going to him for help on tough problems. Merryfield is survived by his wife, Margaret, and his two adult children, James and Laura.